Recent climate marches have captured our collective attention. Students and young people around the world have taken to the streets to demand action on climate change now, in order to protect the environment for a better future. The impacts that we can already see are not the only climate impacts that will affect quality of life for future generations. Some climate dangers have yet to materialize. We turned to some of our authors to find out—What do they think will be the most pressing climate change issue in the next 50 years? Why? The most pressing climate change issue will be our capacity to provide adequate nutrition and water to every person on Earth. This is a challenge we already struggle with and climate change will increasingly cause droughts and extreme weather events. Both our water sources and agricultural production are sensitive to these climatic shifts. Potential future food and water shortages will lead to increased global unrest and political tensions. However, we can take steps today to prevent these future shortages by developing sustainable adaptation strategies. Our greatest strength as humans is our capacity to innovate, and if we do so carefully and responsibly we'll be able to prevent many of these future crises. Clearly, the most pressing climate issue is figuring out how to get the global economy to carbon neutrality, and then developing the technologies for economically taking large amounts of carbon out of the atmosphere. But another critical issue that is not yet really being addressed is how we get in place national and international regimes to manage massive human migrations that will be driven by climate change. Regardless of the success that the global community has in implementing deep greenhouse gas reductions over the coming decades, we already know that anticipated future climate impacts will eventually cause large-scale migration of populations away from areas that are threatened by climate risks such as sea level rise, extreme heat, extreme storms, drought and wildfires, and towards areas of lower risk. The timing and geographic distribution of these movements is highly uncertain. They will, however, have a large impact on both the areas that lose population and the areas that gain population. And they will cause substantial economic, social, and political turbulence. As one commentator noted: "You can set up a wall to try to contain 10,000 and 20,000 and one million people, but not 10 million." How will we manage this climate migration? What legal status will the migrants have? How do we prepare the areas that are losing population, as well as those that are likely to find themselves with large unplanned in-migrations? It is time to start digging into these questions. In my view, the largest threat to Earth in the decades to come will be unsustainable human population growth. This will trigger all kinds of irreversible environmental change. A smaller human footprint means first of all fewer feet. Most scientists agree that climate change will increase the occurrence, intensity, and duration of extreme weather events, including flooding, hurricanes, droughts, heat waves, and wildfires. If we don’t do anything about this, most cities will become less comfortable—some by a lot. Depending on their location, cities and their inhabitants could suffer from the following possible scenarios: too wet, too dry, or too warm. Homes could be flooded on a regular basis, water faucets could stop flowing, or people’s lives could be confined to air-conditioned interiors because outside will be too hot. Fortunately, architects and city planners can help increase urban resilience—the ability of urban communities to bounce back from shock. If we do it right, we can even think of this as an opportunity to improve our cities and buildings. Dikes could double as flood protection and functional buildings, native species and drought tolerant plants can save water used for landscaping, and trees and plants can help cool down urban spaces. The future has always been uncertain, but our future may be even more uncertain. With climate change impacting our cities in unpredictable ways, the big question is: how do we design with these new risks? Climate change, as western U.S. water scholar Brad Udall frequently points out, is water change. What Udall means is that, even as we work toward reducing greenhouse gas emissions, we need to focus on reducing our vulnerability to changes even now being felt in the planet's hydrologic cycles. That can mean more water where we don't want it—think for example the flooding felt in the central United States from a freak storm in March 2019, or the creeping rise of sea level confronting our coastal cities. It often means less water where we've come to depend on it, like the shrinking reservoirs of the Colorado River Basin. Preparing for a future of water change is essential regardless of how successful we are in reducing our greenhouse gas footprint. The transportation sector remains one of the largest contributors to greenhouse gas emissions, and thus represents the lowest-hanging fruit for governments looking to meet difficult carbon-reduction targets. Through our research, we've found that the Netherlands provides the best example of a clear path forward. A 2014 World Bank report ranked it in the bottom 25 nations for transport-related carbon dioxide emissions (as a percentage of total national production). In fact, Dutch transportation contributes just a fifth of their overall emissions, compared to a third in the United States, which—with 1.9 billion tons of CO2 emissions in 2016—overtook power generation as the most-polluting sector in the country for the first time in 40 years. Rather than wait for the electric car to save us, we should be looking to the humble bicycle, which—with the right infrastructure and policies in place—could immediately replace a significant number of trips we take by car, and begin moving us in a more sustainable direction for the future of our planet and our children. The most pressing issue in relation to climate change is almost certainly the preservation and, if possible, extension of forest cover. Obviously, we must work toward reducing carbon emissions and increasing the adoption of renewable energy, but even the most optimistic scenarios around that would not solve the problem. Forests, and the oceans, provide the greatest sinks for CO2; we can fight to maintain oceanic biosphere and health, but we could—at least conceptually—increase the area of forests. And we MUST try to halt forest destruction. Society will not only need to prepare for current and impending changes due to climate change, we will need to do this while taking drastic action to avoid catastrophic consequences in the future. 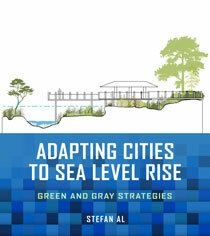 Many cities are vulnerable and dealing with the effects of climate change already. Forty percent of the United States’ population lives on 10% of its land mass—along coastlines. While cities have the power to make a greater impact on how we prepare for climate change, future planning and growth needs to be coordinated, thoughtful, and innovative. To start, policymakers should embrace and champion policies that encourage walkable, urban places and associated density—particularly in suburbs. Walkable, urban places create the opportunity for a lower carbon footprint, while contributing to a better quality of life for residents. While the costs of adapting to climate change will be historic—in the US exceeding in real dollar terms the costs of fighting World War II and building the interstate highway system combined—the costs of inaction will be catastrophic. The UK’s National Oceanographic Centre (NOC) estimates annual global costs of climate-driven flooding, only one of multiple climate change impacts, at more than US$14 trillion. The NOC also projects that more than six hundred million people could be displaced by rising seas alone by 2100. In the US, seven of the ten most economically productive metros—representing roughly one-quarter of the entire economy and growing 50% faster than the US as a whole—face serious risks from rising sea levels. Yet a blinders-on, single-issue focus on resiliency can mean falling into an all-too-familiar priority trap that pulls resources away from other compelling challenges. For example, the developed world is rapidly aging. People over the age of 65 will represent more than half of America’s (and the developed world’s) net growth for at least the next two decades—placing extraordinary stresses on healthcare costs that are projected to eat up all discretionary US federal spending by 2050. Growing income disparities in the US and across the developed world, accelerated by the shift to a knowledge economy that delivers most of its economic benefits to the better-educated top 20% of the workforce, are generating growing social as well as economic strains. Rapidly evolving technology means that within two decades the US and rest of the developed world will need to retool trillions of dollars in transportation infrastructure to adapt to autonomous mobility while at the same time responding to automation’s projected evisceration of the jobs of tens of millions of workers in the US alone. Nor can government stop funding transit, parks, and education—without facing grave social unrest and economic decline. And already today the developed world faces an enormous bill for fixing existing infrastructure—a figure that in the US will reach US$2 trillion, or almost 10% of the entire US economy, by the late 2020s. I just returned from Sweden where it’s all about climate change. The government is planting trees around the world, as well as working hard to reduce Sweden’s carbon footprint. Recycling options are everywhere. At the university where I spoke there are only washable dishes, cups, silverware in the cafeteria and break rooms. Everyone over four years old rides a bike, and those under four are in contraptions attached to an adult’s bike. Greta, the 16-year-old Swedish climate change activist, is inspiring us all with her courage and passion. For me the key question in tackling climate change is: Will we be willing and able to follow and support the youthful leadership taking on the challenge? It’s easy to write off the younger generation as inexperienced, whimsical, lost in their devices. That is old-fashioned and destructive thinking. These young activists are on the frontline of climate change, and we need to put our faith—as well as our money, influence and energy—in their leadership. Creating extensive ecological networks consisting of well-connected, large protected areas is most pressing priority because it is our best option to limit the extent of the sixth mass extinction. Climate change is adding to and exacerbating other threats to biodiversity, such as habitat loss, invasive species, pollution, over-exploitation of natural resources, and environmental degradation. Ecological networks can reduce the impact of all stressors, promote population persistence, and allow species to adapt to climate change by moving to climatically suitable areas.